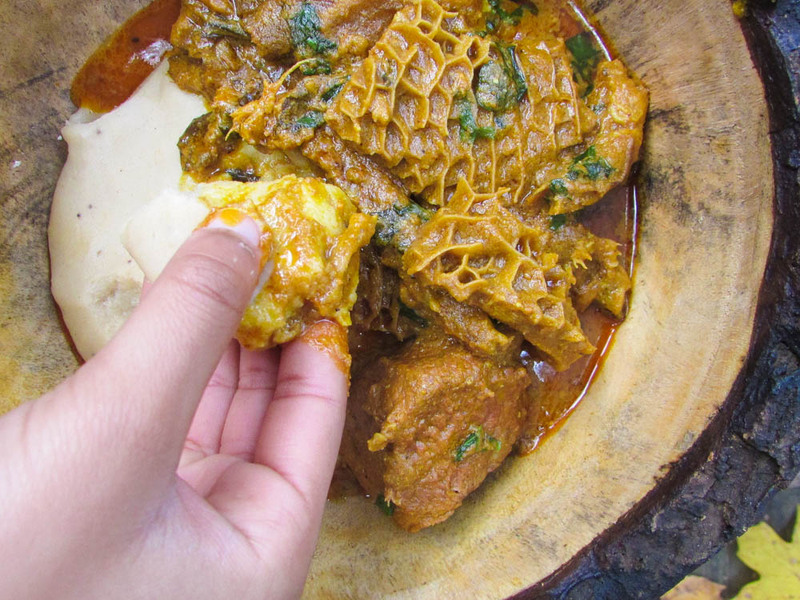 Ghana meets Nigeria in this delicious bowl of Palm nut soup and Ghanaian fufu. Palm nut soup in all it’s deliciousness, seems to be quite common in the African continent. Different countries in Africa seem to have their different styles of making this soup, but today I shall be treating a recipe from Nigeria and one indigenous to the Igbos in the Southeast of Nigeria. Just so you know, in Nigeria alone there are more than four different styles of cooking this soup; all cooked with palmut cream as the base. I particularly enjoyed the Ogiri in this soup. It was my first time using Ogiri in Ofe Akwu and I have to say I have not made it any differently since then 🙂 If using Ogiri, you may want to be careful how you add salt and any other seasoning. You know Christmas is a few weeks away and no be everytime rice and stew. Ofe Akwu is also bae abi? In a pot, season the meats and stock fish with salt, 1 tbsp. of the crayfish, the dry pepper and bouiilon(if using). Pour water to the level of the meats and cover. Cook until the meats and stock fish is tender. 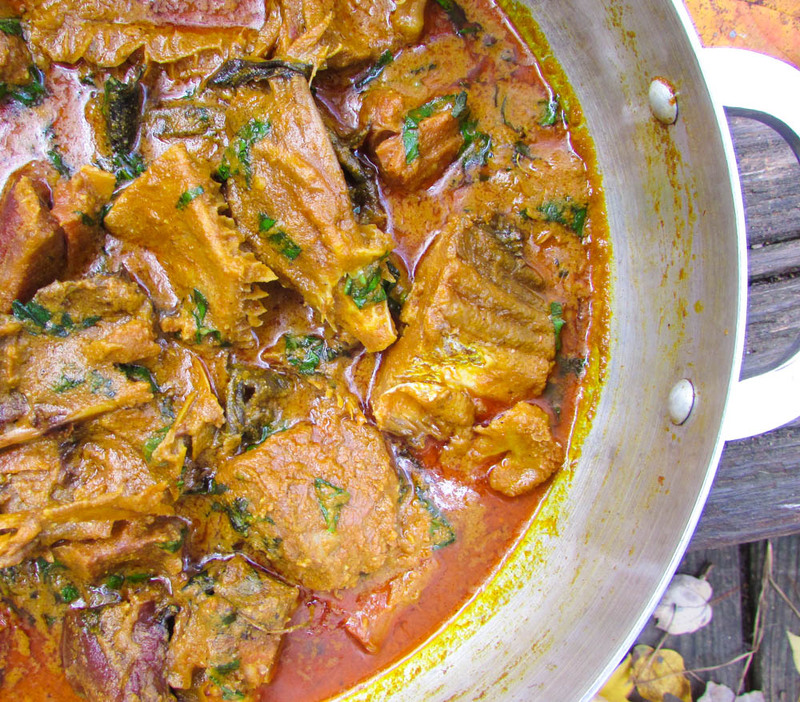 (If the meats softens before the stock fish, remove the meats and cook the stock fish until tender) Once done, add the palm nut cream and stir to loosen. (Add more water to your desired thickness if needed). Bring the pot to a boil until the oil from the palm nut cream floats to the top. Add the remaining crayfish, ogiri(if using), meats(if you had to remove them from the pot to cook the stock fish) and chili. Stir to combine and cook uncovered until the soup comes to your desired thickness. Add the uziza and basil(scent) leaves. Season with salt and bouillon(if using) Stir, cover the pot and turn off the heat. The remaining steam in the pot will cook the herbs. Blend the raw Cassava, Plantain and 400mls of water together into a smooth paste. Pour the paste into a pot, and place on medium heat while constantly stirring until the paste has thickened. This helps to avoid lumps from forming. Add the remaining 200mls of water to the pot, cover and reduce the heat. Steam for about 10minutes. Increase the heat and stir the mixture until it is well combined. Ndudu's fufu note "Please don't be alarmed, if your Fufu looks too soft, it get's firmer once it has cooled down." This entry was posted in Fufu, main dishes, main meals, Nigerian local soups, Nigerian sauces, Nigerian soups, Nigerian Stew, Nigerian stews, Sauces, Soups, Southeast recipes, stew, Stews, Swallow, Uncategorized and tagged banga soup recipe, cassava fufu recipe, fufu recipe, Ghana fufu recipe, Nigerian food blog, Nigerian fufu recipe, Nigerian local soups, Nigerian soups, Ofe Akwu, Ofe Akwu recipe, palmnut soup recipe, Plantain fufu recipe.